The 911 District has received a report that individuals identifying themselves as representatives of the 911 district have asked patrons of F. Gilbert State Park to leave the park stating that is was now owned by SEMRECC. These individuals are NOT affiliated in anyway with the 911 District or any town. The F. Gilbert State Park is accessible as normal, including High Rock Road. If approached by an individual claiming to be an affiliate of the 911 District or "SEMRECC" who is asking you to leave the park, please move to a location that you feel safe and call 9-1-1. The local police department has been notified as ask to investigate the origin of this report. 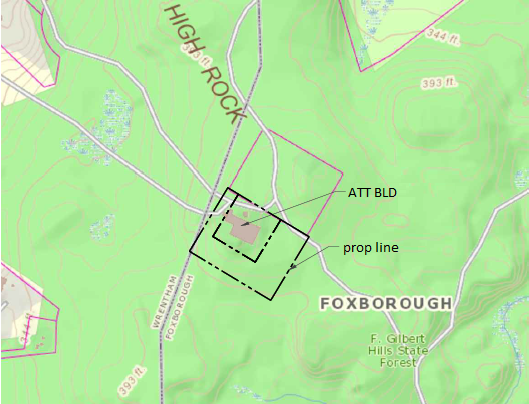 There is a portion of land located in the state forest area that is privately owned at the top of High Rock Road. Access and use of this area is subject to the approval of the land owner. This land is not owned or leased by the 9-1-1 District. This map is not to scale and is a general representation of the property line for informational purposes.